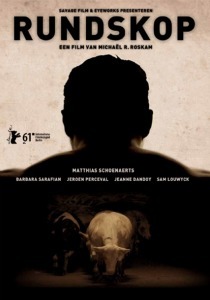 In June of last year we were privy to the first batch of images from MichaÃ«l R. Roskamâ€™s crime drama Bullhead (Rundskop). Around these parts we were pretty excited about the project which was being shot by one of our favoured cinematographers Nicolas Karakatsanis and the first batch of images were fantastic. A police murder and the following investigation create panic in the so-called Belgian â€œcattle hormone mafia.â€ During a transaction, an illegal growth hormone dealer and a police informer face each other in a crime investigation. But then a dark and unsettling story about loyalty and friendship unfolds through their tormented past as childhood friends.